This is the original unchecked version of the model imported from the previous CellML model repository, 24-Jan-2006. The Kv4.3-encoded current (IKv4.3 ) has been identified as being the major component of the voltage-dependent, calcium-independent, transient outward current Ito1 . In turn, this current has been shown to play an essential role in shaping the morphology of the early phase of the cardiac ventricular action potential. However, its influence on action potential duration remains unclear. In order to help resolve conflicting experimental results, in 2000 Greenstein et al. published Markov models of the human and canine Kv4.3- and Kv1.4-encoded currents. These were embedded within a canine midmyocardial ventricular myocyte model which was previously published by Winslow et al. (1999) (see the figure below for a schematic of the model). Model simulations helped to elucidate the mechanisms by which Ito1 influences action potential shape and duration. Strong coupling between L-type Ca2+ current and IKv4.3 was observed. In addition, a bimodal relationship between IKv4.3 density and action potential duration, such that changes in IKv4.3 density may either lengthen or shorten action potential duration, depending on the baseline Ito1 level, was also predicted. The raw CellML description of the model can be downloaded in various formats as described in . 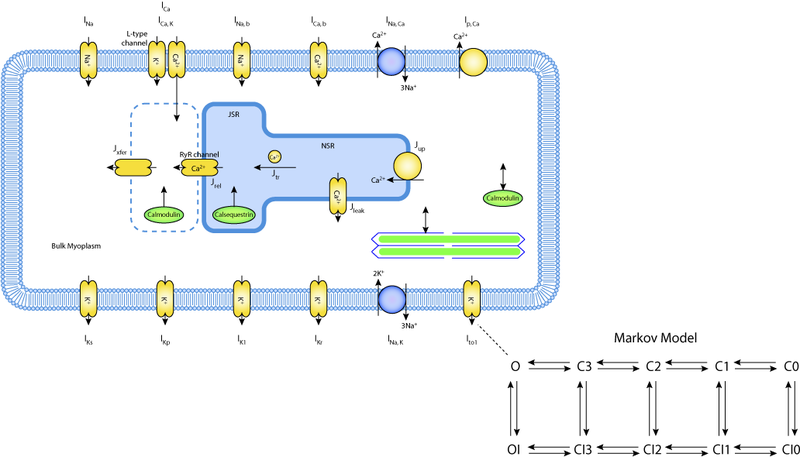 A schematic diagram describing the current flows across the cell membrane that are captured in the Winslow et al canine ventricular cell model. The canine Ito1 current described in the Greenstein et al. 2000 paper is embedded within this whole cell model. The Markov model structure consists of four closed states (C0-C3), four closed, inactivated states(CI0-CI3), one open state (O), and one open-inactivated state (OI). The transition rates are voltage dependent, and scaling factors are used to couple inactivation to activation. Derived from workspace Greenstein, Wu, Po, Tomaselli, Winslow, 2000 at changeset ce79de95f0f4.